Did you know you can buy both editions of Stories for Home in actual, real, bricks-and-mortar shops? The very glamorous Shelter Boutique in Muswell Hill has copies of both books snuggled in with some very fetching fashion. Fabulous shoes and equally fabulous writing can both be found at Boutique by Shelter, 44 Muswell Hill Broadway, London, N10 3RT. Also in North London, The Big Green Bookshop hosted a wonderful reading event for us in January and are still stocking the book. You can find them at Unit 1, Brampton Park Road, Wood Green, London, N22 6B. They are also very worthy of a follow on Twitter. In other news, the SfH team put in a good showing at the Monday night quiz at the Alexandra Pub in Wimbledon this week, coming a creditable 7th, only 6 points behind the winning team (photo via Isabel Costello on Twitter). Thanks to the generosity of both donors and bidders, our auction raised over £500 for Shelter. One generous winning bidder made a further donation to Shelter when they won their item for less than they had been prepared to bid in total. Combined with sales of Stories for Homes 2 and donations made at events, we have raised nearly £3,000 for Shelter since Stories for Homes 2 launched in September. Not ready to rest on our laurels, we have plans for another auction later in the year with some truly amazing lots up for grabs. Keep following us here and on Facebook and Twitter to be the first to know. London reading events, north or south of the river, take your pick! 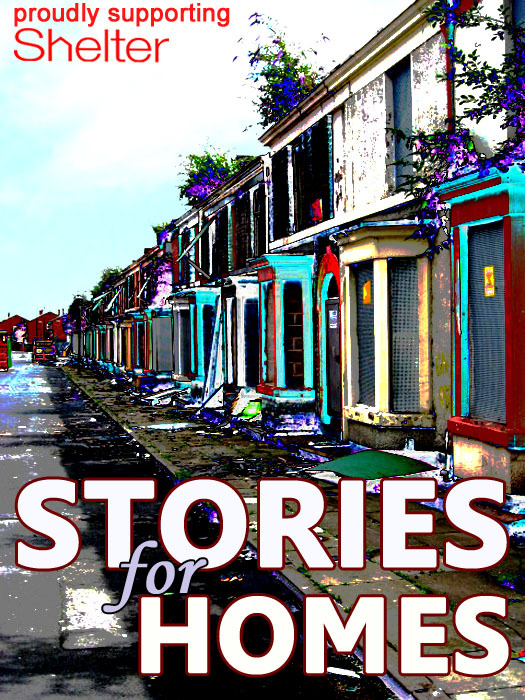 We have not one but two Stories for Homes 2 events this week, both based in London. On Thursday we’re being welcomed by the famous Big Green Bookshop in Wood Green. On Friday we have a pay-at-the-door event at the community run Ivy House in Nunhead, with music from the Sing Eazy choir as well as readings from Stories for Homes authors. All proceeds, as ever, go to Shelter. Details for both events can be found here. Don’t forget our fabulous auction – most items close tomorrow (Thursday 18th January). We’d love to top £500 in funds raised for Shelter so do please have a look at our eBay page here. There is something for everyone, from signed books and CDs to the original painting created for the Stories for Homes 2 cover and a signed print by Viz artists Barney Farmer and Lee Healey. Stories for Homes Auction launches at the Alex. The Stories for Homes auction is now OPEN! It runs until 18th January, with some truly spectacular, one-of-a-kind lots to bid for. Head over to our eBay page to take part in the auction. Every penny from the winning bids goes directly to Shelter. We are too excited about the Stories for Homes 2 auction lots to keep quiet any longer, so here is a sneak peak of one of our most exciting offerings: an original signed Viz comic strip print, donated to Stories for Homes by artists Barney Farmer and Lee Healey. Lee and I thought this strip apt, as one aspect of the housing crisis less discussed at present (due solely to the explosion of rough sleeping and homeless itself, it must be said) is the appalling quality of much temporary accommodation into which 80,000 households and 128,000 children – in England alone – are currently dumped. At its worst it ruins health, shatters self-esteem, and is surely the worst possible start in life for all those children. Barney Farmer and Lee Healey are the creative duo behind Viz magazine’s Drunken Bakers strip, as well as work in Private Eye and Dirty Rotten Comics. We are enormously grateful to them both for donating this art work to our auction. The auction goes live TOMORROW (Monday 8th January) at 10pm. You can follow us on eBay now by clicking here, and get ready to get bidding! Are you ready for the SfH online auction? Our online auction kicks off on Monday 8th January at 10pm on our dedicated eBay page. 100% of the winning bids goes to Shelter – eBay doesn’t take any fees for auctions where all the proceeds go to charity. The star of our auction will be the original artwork that Sally Swingewood painted especially for our beautiful Stories for Homes 2 cover. We also have salon treats, meals, signed CDs and books, and a few surprise lots that will blow your socks off! Thanks to everyone who has donated items for the auction – as ever, we couldn’t do any of this without the kindness and generosity of so many people. The auction goes live at 10pm on Monday 8th January, after our reading event at The Alex (see our events page for more details) and runs until 18th January. Follow our eBay page now so you don’t miss a thing! Stories for Homes Auction for Shelter – coming soon! We have been beavering away behind the scenes putting together a new fundraising event – an online auction with all proceeds going to Shelter. Star of the show will be the original painting by Sally Swingewood seen on the stunning cover of Stories for Homes 2. There will be other exciting lots too. Official launch will be at our reading event on Monday 8th January at the Alex pub in south west London – full details here. Keep an eye on our social media and this blog for updates and information on how you can bid.